The 409 Mowers is a lawn care service serving Southeast Texas, including Groves, Orange, Port Arthur, Beaumont, Orangefield, Port Neches, and Nederland. We offer great local reviews, credit card payments, and consistent, reliable lawn service for your home or business. You might be asking yourself, how should I pick a lawn service near me? There are so many lawn maintenance companies in southeast Texas that it can be hard to determine which one to pick. Naturally, we would love it if you would pick The 409 Mowers to be your lawn care company, but in the interest of taking a fair look at the question, here are some things to keep in mind when selecting a company to mow your lawn. Whether you live in Beaumont, Groves, Port Neches, Nederland, Port Arthur, or Orange, these tips will hold true. Why Pick a Local Southeast Texas Lawn Company? Beaumont and Southeast Texas has grown over the years, and because of the tropical climate, lawn maintenance is a good business to be in. For that reason, some larger and national lawn companies have set up shop. What is the difference between a large company and a local, southeast Texas lawn service? The answer is “personalized service” and “accountability”. The 409 Mowers offers services that rival the big guys – like instant quotes and evaluations after every lawn service. What’s more, you can always pick up the phone and call us at (409) 571-2212, just as you would your neighbor. You can be assured we will cut your grass in a consistent and healthy manner. Also, rest assured knowing you’re in safe hands with a copy of our insurance policy sent out with every quote. What Do I Look for to Choose the Best Lawn Company in Southeast Texas? When you’re choosing the best lawn company to cut your grass or to landscape and beautify your lawn, you might choose a company based on customer testimonials. If they don’t have these available check their reviews on Google. Also, check and see if they present themselves in a professional manner online and in person. By using these methods, you can start to see if the lawn service is reliable and if other people are having good luck with using them. What if I have a problem with weeds and pest control? What if I need to replace my lawn after a storm? It’s important to find out if the lawn company uses safe chemicals for your lawn, and if they have experience applying the right weed or flower bed treatments at the right time. Do they follow the manufacturer directions for lawn or flower bed maintenance? Only by using the right outdoor pest control programs, can you guarantee you can keep mosquitos and other pests at bay while making your lawn look the way you want. Some lawn companies specialize in laying sod, weeding, and replacing your lawn. This type of lawn care maintenance requires specialized equipment and a carefully trained lawn technician, in order to provide the best results. Southeast Texas lawns are typically made of San Augustine grasses, which are hardy and typically survive cold weather very well. The 409 Mowers does have clients where sediment and chemicals during recent floods damaged or destroyed their lawn. Switchgrass and other types of weeds can invade the yard, and at that point the only option is replacement. It’s important to choose a lawn service that can deal with problem lawns, laying sod, seeding, and soil testing, so that you can realize the most beautiful lawn you can imagine. You might ask yourself, “Why should I hire a professional lawn service?” It’s true that some people choose to cut their own grass. They also have to weed and tend to their own flower beds and landscaping, lay mulch, trim trees, and test and care for the soil. Of course, all of our clients at the 409 Mowers want a beautiful lawn, but it’s a lot of work to maintain a lawn properly, and it takes up a lot of time. In order to get a lawn that makes you smile when you see it, you have to do a lot of work in the southeast Texas heat. 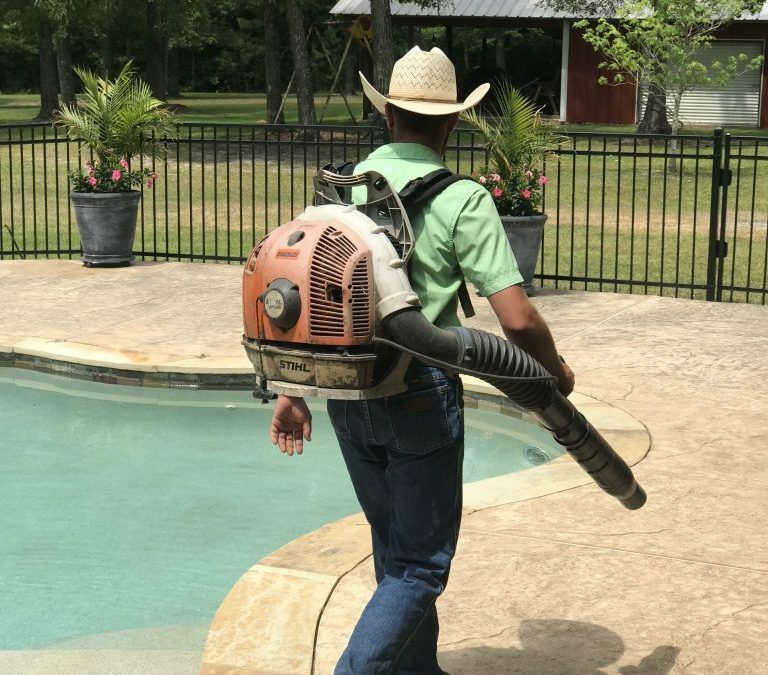 Lawn service in southeast Texas in the summertime can be outright dangerous if not taken seriously. Do it yourself lawn maintenance can be time-consuming The average person in southeast Texas spends over 70 hours a year on lawn maintenance. You could be relaxing, visiting family and friends, working on a hobby, or doing other productive activities, instead of working on your yard. Some of our clients have older parents or grandparents who love a beautiful yard that is the envy of their neighborhood, but they can no longer spend the time in the Texas heat to get the results. For those reasons, sometimes it’s better to hire a professional lawn service like The 409 Mowers. Should I get the cheapest lawn service? Lawn service in southeast Texas doesn’t have to be expensive. Because of the frequent growth, warm weather and tropical environment of southeast Texas, lawns grow fast and plentiful. That has spurred many companies and kept lawn service pricing reasonable. Lawn care costs are typically about the same for a lot of lawn service companies. To us, it makes sense to pick the lawn service that is one of the highest rated lawn services at the best price. Quality lawn service typically doesn’t cost much more than a cheap lawn service, and you get much better results. The 409 Mowers has one of the best reputations for lawn services in Southeast Texas. We want to be your number one lawn service in Beaumont, Port Arthur, Nederland, Groves, Port Neches, and Orange. We are a top rated, reliable lawn service that gives convenience to Southeast Texas. We offer credit card payments, consistent schedules, and 24/7 online account access. You can rest assured we are a trusted, insured and reputable lawn service company. We can provide you lawn maintenance services for residential and commercial properties. If you’re looking for someone to provide Lawn Mowing, Weed-Eating, Lawn Care, Hedge Trimming, Lawn Maintenance, Leaf Pick Up, Flowerbed Maintenance, Yard Clean Up, or Mulch Installation, contact The 409 Mowers for your instant free quote. Call The 409 Mowers Today at (409) 571-2212 today, or you can get a quote right now by using our online quoting tool.